I told you we've been busy. When we moved in, our front yard was less than decent at best. If you look closely you can see the dead crappy tree blocking the bay window, a shabby roof (they replaced that of course), and a weird flower garden full of wood chips that took up half the yard. Honestly, I think there was a fern, but not a single flower in that garden. Our neighbors informed us that the previous owner covered half his lawn with wood chips to make the upkeep easier. To each their own, eh. It's been two months and this is what we've got. 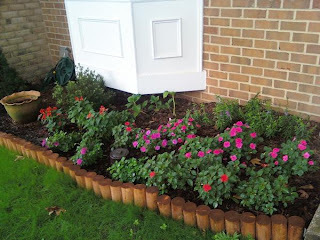 The border looks good, considering we were redecorating on a major budget. We are both incredibly proud of our grass growing skills. Especially because the huge tree in our yard blocks almost all sun. I'm also loving the flowers. 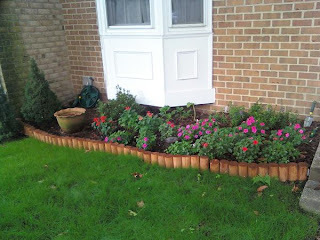 For now we've got a lot of annuals in there, but there are some perennials towards the back and I hope they'll fill things in next spring! I'm amazed at your grass growing skills. Looks great! Very pretty! I really need to get it in gear sometime and finish my yard! It looks awesome! You guys have done a great job.